Whether you’re preparing for a huge, extravagant celebration or a more intimate affair, planning a wedding is never easy. There are just so many moving parts and they can start piling up fast, which is why it’s so important to keep things organized along the way. After all, you don’t want to miss or forget something. Luckily, when you’ve been to and through as many weddings as our NY & NJ wedding videographers have, you pick up a few tricks along the way for staying organized. So, read on to learn about a few. Like mentioned above, no matter the size nor style of wedding you’re planning, there always seem to be a ton of moving parts. The list of tasks to do just never seems to end and simply deciding where to start can be an issue all in itself. That’s where some prioritization comes into play and, trust us, a little goes a long way. So, sit down with your partner early on in the process to determine what matters most to you and your wedding and what matters least. What can you absolutely not live without and what couldn’t you care less about? Don’t just stop at the top ten, either. Try to include every single task you can think of on the list, in order. Then, simply work your way down. Yes, this will help to ensure that the most important parts of your wedding are taken care of first, but it will also keep the entire process organized and focused. Rather than having a bunch of outstanding tasks with no clear direction, at least you’ll have a prioritized list to keep you on track. While a prioritized list will be a huge help all by itself, you can also take it a step farther by using that list to create your own timeline of tasks. Once you know what matters most, then you can decide on the steps you need to take to make it happen and the times/dates at which you need to complete them. You should obviously try to give yourself plenty of time, but the point is that a timeline can be a great organizational tool and if you’re going to make one, then you’d might as well make it pop visually. 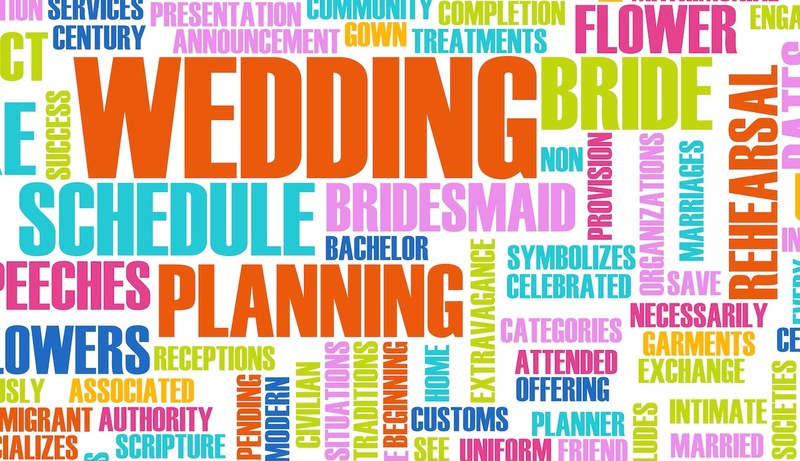 And, no, it’s not about wasting time making a simple wedding planning tool look pretty. Adding some bold visuals can help to ensure that your calendar and the reasons you created it don’t get forgotten. You can even come up with a pattern of visuals based on the task’s level of importance, but in the end, it’s just about ensuring that everything remains relevant in your mind. Another great way to keep things organized is to create or designate a specific area strictly for planning-related activities accessories. It could be a desk or part of another room, or it could just be a box or a drawer. It really just depends on the kind of space you have and are willing to give and the amount of wedding planning materials you’ve got. First off, this will help to ensure that nothing gets forgotten or misplaced. You’ll have just one place to put things and one place to look when you need them, but it’ll also help to keep you focused as you move from task to task. You’ll have your spot and all the tools you need right there. Additionally, having a designated spot will also keep the rest of your living space clear of wedding-related stuff. Take it from us, you’ll spend enough time thinking about your wedding and keeping all your planning materials in one area will allow you to get away from it all when you need to. We’ve been doing wedding videography in NJ for long enough to know how far al title organization will go when it comes to planning. The bottom line is that planning a wedding, any wedding, is challenging enough, but if you don’t stay organized, then it’s all but impossible. We hope these tips help and be sure to check back with us for more in the future.